Realistic Vue™ displays high resolution 3D anatomy with exceptional detail and realistic depth perception. User selectable light source direction creates intricately graduated shadows for better defined anatomical structures. Comprised of a suite of outstanding imaging applications (Multi-Slice View™, Oblique View™, and Volume CT™) , 3D XI™ offers precise control over 3D/4D volume data manipulation to improve diagnostic accuracy. 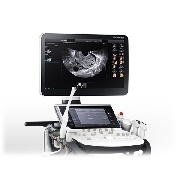 With Samsung's 5D NT™, operator dependency can be reduced for the first trimester fetal nuchal translucency (NT) measurement. 5D NT™ allows the user to obtain the true mid-sagittal plane automatically by rotating and auto-zooming the image. This advanced technology is especially useful when facing difficult cases involving fetal position. 5D Follicle identifies and measures multiple ovarian follicles for rapid assessment of follicular size and status during gynecology examinations. Hello Mom™ supports simple and secure transfer of fetal ultrasound images and clips wirelessly from the HS40 ultrasound system directly to an Android smartphone or iPhone application. These images can then be shared easily with others. * Hello Mom™ is not an applicaion for diagnosis. This new harmonic technology provides greater image uniformity from near to far field while reducing signal noise. Combined with ClearVision and MultiVision, S-Harmonic™ improves the image quality of HS40. The noise reduction filter improves edge enhancement and creates sharper 2D images for optimal diagnostic performance. The integration of specialized Samsung technology results in a notable improvement in image quality. In addition, ClearVision provides application-specific optimization and advanced temporal resolution in live scan mode. 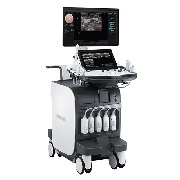 MultiVision controls ultrasound beam electronically by steering, and compounds many scan lines for better image. MultiVision provides remarkable spatial and contrast resolution with even greater artifact suppression than ever before. With one touch, the user can select the most common transducer and preset combinations. Quick Preset maximizes efficiency to make a full day of scanning simple and easy. EZ-Exam+™ enables users to build or to use predefined protocols. 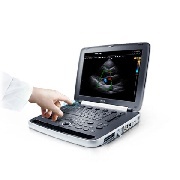 It transforms the ultrasound investigation into a streamlined process. EZ-Exam+™ ensures the full investigation is performed, eliminating the risk of forgetting an image or loop capture, as well as measurement and transducer preset changes. A diagnostic ultrasound technique for imaging elasticity, ElastoScan™ detects the presence of solid masses in tissues and converts any stiffness into color images. Auto IMT+ is a screening tool to analyze a patient's potential risk of cardiovascular disease. It allows easy intima-media thickness measurement of both the anterior and posterior wall of the common carotid by the click of a button. This simple procedure enhances exam productivity and adds diagnostic value. NeedleMate+™ ensures precise needle targeting when performing commonly used intervention procedures. 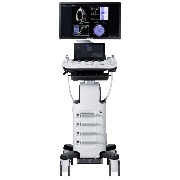 Panoramic imaging displays an extended field-of-view allowing users to examine a wider area. Panoramic imaging also supports angular scanning with data acquired from the linear and convex transducer. Strain+ is a quantitative tool for global and segmental wall motion of the left ventricle (LV). In Strain+, three standard LV views and a Bull's Eye are displayed in a quad screen for easy and quick assessment of the LV-function. A HS40 készülék 21,5"-os LCD monitorral (LED háttérvilágítás) rendelkezik, ami kiváló kontrasztot, felbontást, képminőséget és élénk színeket biztosít minden fényviszony esetén. A Samsung 10,1"-os érintőképernyője rendkívül érzékeny, lehetővé téve a hatékony interakciót a vizsgálat közben. Kétfokozatú gélmelegítő gondoskodik az ultrahang zselé kellemes hőmérsékletéről. A rendkívül csendes készülék lehetőséget biztosít a fizikai vizsgálatok végrehajtására is, beleértve az aszkulációt is, így a készülék bekapcsolt állapotban maradhat. Állítsa be a készüléket a kívánt magasságúra felfelé és lefelé is erőfeszítés nélkül a gázos emelőszerkezetnek köszönhetően. A HS40 készülék rendelkezik az oldalára szerelt endocavitalis vizsgálófej tartóval a nőgyógyászati vizsgálatok kényelmes végzéséhez. Állítsa be a monitor magasságát a kívánt magasságúra felfelé és lefelé is erőfeszítés nélkül a gázos emelőszerkezetnek köszönhetően. A készülék oldalzsebe ideális tablet, páciens karton vagy más egyéb tárolására, amire elérhető távolságban mindig szüksége lehet.